The universe of Traveller is one of the most fully realized game settings ever created. Adventures take place against the background of a vast, star-spanning empire, with a history dating back over a thousand years. Locales can range from a crowded spaceport to a lonely frontier outpost. Characters can be merchant princes, diplomats, soldiers, politicians, criminals . . . or all of them at once. Political intrigues, trading schemes, mind-wrenching alien enigmas, mercenary raids, wars . . . almost anything is possible. First published by Game Designers' Workshop in the summer of 1977, Traveller was one of the first science fiction roleplaying games (indeed, it was one of the first RPGs of any sort). 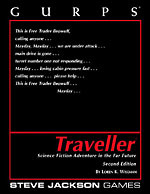 Traveller rapidly became the standard against which other SF roleplaying games were judged, and influenced many other designs in many other genres. The game went through several editions over the years, and quite a few changes were incorporated along the way. One of these was the Rebellion, something GDW did to bring conflict and excitement to campaigns that had become dull and mundane. In the 1116th year of the Imperium, Emperor Strephon was assassinated by a rival, and the Third Imperium split into several factions. This change brought excitement to many campaigns, but other players and referees felt that the universe was exciting enough without an empire-wide civil war. It is for these people that an alternate history has been created, where Strephon, the 43rd Emperor of the Third Imperium, lives and the Rebellion never happened. This is not to say, however, that all is well with the universe. A story without conflict is about as interesting as a telephone directory. So, expect things to happen in this universe . . . changes will occur. The undercurrents and discontents that led to the Rebellion are still unresolved. The vast scope of the Traveller background will become available to GURPS players and GMs, without the destruction and dislocation caused by the Rebellion. There is, however, a second reason for GURPS Traveller. Many of the original books that detailed the history and background of the Third Imperium are long out of print. Now new players and referees can have access to the same information as twenty-year-long grognard/collectors, and their enjoyment of Traveller can only benefit. e23 offers scenarios, background information, deck plans, and zines, in digital form, for GURPS Traveller – as well as many of our other game lines. Surf our site for the files you want . . . and get them instantly with a credit card or PayPal. Check out this handy list of all our GURPS Traveller supplements! A Traveller banner for linking to this site. The Journal of the Traveller's Aid Society (JTAS) is the official online magazine of Traveller. Subscription information can be found here. Discuss Traveller in the Steve Jackson Games Forums.